lean over the railing of a bridge. Riddles (Koans) and their answers are the holy grail of Zen. The riddles are known, the answers are hidden. Suppose you find the secret solutions of some Zen riddles. Does that show your enlightenment? Nonsense. Read the secret answer of Zen riddles in the box at the right. Try again? OK. Down the page there are more Zen riddles and their answers. Where do Zen riddles come from? What is their origin? Some background information. Gotama Shakya, an Indian monk in 5th century BC, for many years struggled with the question, why is all of life nothing but suffering (Sanskrit: dukkha). Finally, after a night of meditation and hallucinations, he saw the morning star and cried: All the world is already enlightened. That's not a proper answer for the suffering question, is it? But it worked. Gotama Shakya was suddenly enlightened and from that day on he was a sage, (Sanskrit: muni) called Gotama Shakyamuni or simply Buddha. The Buddha's riddle-solving by meditation only was later used by Chinese Buddhists to provoke highly educated Confucians. These riddles were about crazy but enlightened Buddhist masters. To find an answer, logic, reason and arguments had to be suspended. Jumping into creative madness was necessary instead. Shortened versions of these riddles came to Japan in the 13th century and were soon forgotten. remembered the old stuff and claimed the riddles as a Japanese heritage of Buddhism. He also preached the medieval Chinese belief that dealing with paradoxical questions implodes the mind and thus makes Buddhists enlightened. This crude theory reigns until today as the deep mystical secret of Zen Riddles. These answers have to be secrets, so that everybody who knows them proves her enlightened mind. You still want to come closer to enlightenment through Zen riddles? Ok. Here are some more riddles and their secret answers. 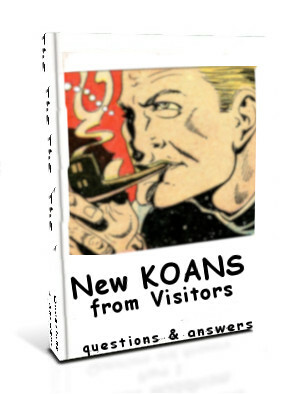 For a more systematic overview on how you, yourself, are involved in Koans and how to answer them goto Zen Koans. Only in 20th century Japanese master spread Zen and its meditation techniques in the US and other western countries. Later it was picked up by Christian priests to reanimate the mystical practices of medieval Christianity. The Japanese Koans about crazy but enlightened Buddhist masters were used in Christian Zen as well. Like Japanese Zen-monks the christians tried to find Koan-answers by suspending logic, reason and arguments. Meditation and jumping into creative madness was again the way of Zen. Looking into a well, a man without shadow is drawing water. Why? A man without shadow might be a ghost. Don't bother. Get the water. How else can you pick a stone out of the water? Having read several Zen riddles and their answers you will realise the pattern. 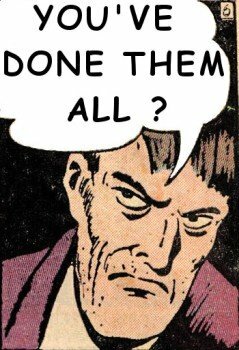 Some answers refer to the "all-is-one" theory of Buddhism and want you to identify with an "object", fire, bell, hand etc. Others illustrate the Zen belief, that the world is simple. Complications only arise from the mind. 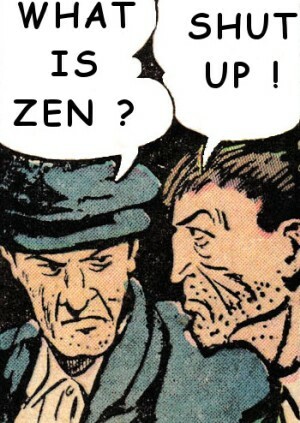 Don't bother about the mind, Zen says. Do what you're asked to do. In both cases don't explain your answer but make it a little (more or less stupid looking) performance. If you want to know about the Buddhist background of these recommendations vist and Zen's World and the 'Person that calls itself I'. Don't forget, meditation is always a good idea to find out about Zen. Silly question. Just show that your speaking. Arising something from some other thing than your bum makes no sense. Stay sitting. Don't bother about empty hands or not. Just take the plough. The why of Zen is a principle of everything, don't bother. When you're crying wipe the tears away and blow your nose.